N59 Arkitekter designed an office for Kapero at Stockholm, Sweden. 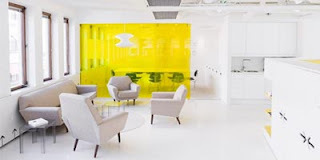 Kapero office has 200m2 area, the interior of this office has a simple and modern design with white and yellow as the main color palette. 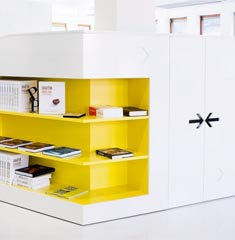 N59 Arkitekter use the Kapero logo as a detail in the cabinets handles and as a wall pattern. The result is a stunning office interior with a high touch of creativity.